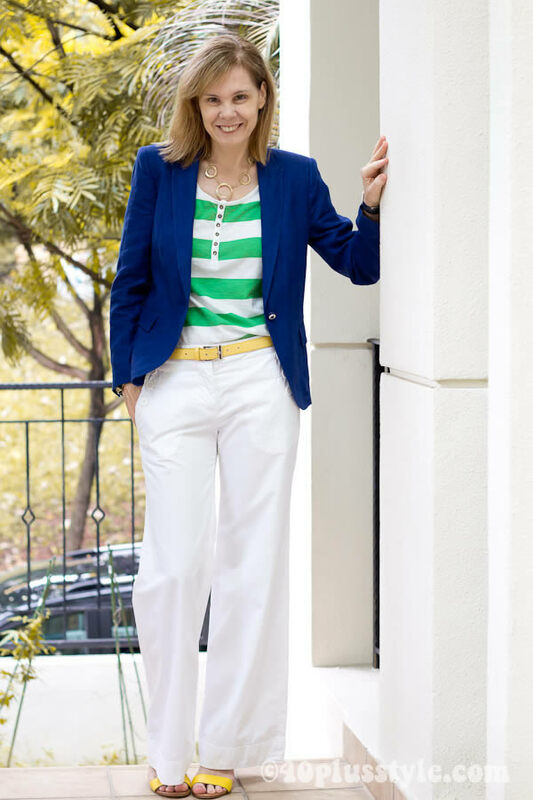 Mixing it up: the nautical marine style! 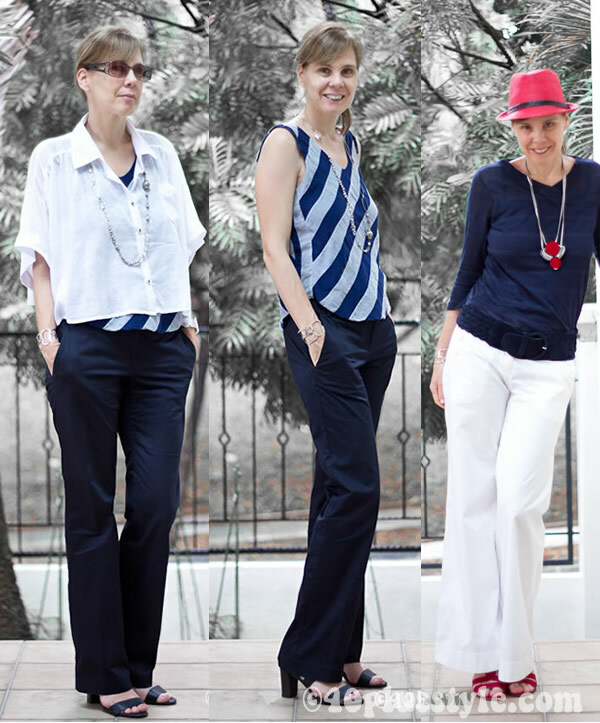 Various ways to wear the navy style! 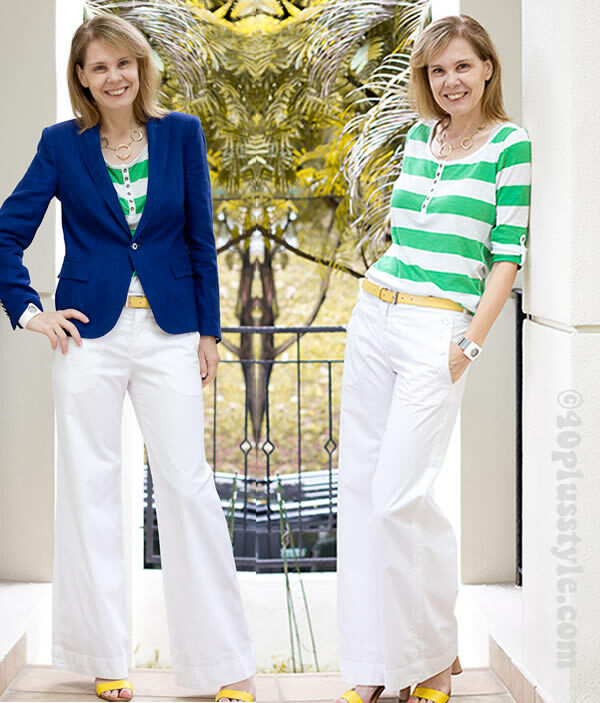 40+ Style » What I wore » Mixing it up: the nautical marine style! The nautical theme is still very popular this season. This is a style I have worn many times so I wondered how I could change it up a bit. Since it’s all about the colours as well this season, I decided to add some colours to the usual blue and white. I normally add red to the mix, but this time went for both green and yellow instead. What do you think. Does it still have a nautical look? Nautical as a trend that is not going to go away any time soon and I identified it as one of the Fall 2012 trends to watch out for. I just wished my climate would accommodate for jackets a bit more. I would love to have one of those typical nautical jackets. But I hardly ever wear jackets here in Singapore, so I will have to have a very good excuse to buy one. The nautical style is usually characterised by the use of marine blue and white and stripes. I would love to add a nice nautical hat into the mix if I had one or an anchor necklace! As you can see this style has been quite popular with me this last year and I have worn nautical inspired styles many times. You can see all looks in what I wore section of the site. Do you like nautical inspired clothes? How do you prefer to wear this style? Your combination of the green/white shirt with the blue jacket is very good. I like the outfit and it is still nautical. Especially because of the wide white trousers. What makes it more interesting than just nautical, is also the adding of the yellow in the shoes and belt. To me blue/white/stripes = nautical, sometimes with a little red added. But really I don’t care much whether it is nautical or not. As long as the outfit looks good. For our boat I choose jeans, flat shoes with neutral soles which you can easily put on and take off and a white or red or red/white top. Usually pretty boring. Once I bought a complete Tommy Hilfiger set of red wide (!) trousers, red/white striped shirt with short sleeves, red/blue striped sweater. But still boring. I love all things navy these days. For me it seems like the new “black” and pretty much goes with everthing and your first outfit is to die for. I agree. It’s so much better than black! Nautical will never ever go out of style….especially in summer! Sylvia you are looking fabulous in all this gorgeous crisp colour lately! I love that you’ve added green and yellow into your nautical look (hmm I think with all my navy, white and red I went a bit overboard with mine… sorry what a terrible joke, I couldn’t resist it, but I did actually mean that I did)!!! I’m having a giveaway if you might be interested? Thanks Catherine. I’m enjoying all the colour and you have certainly be an inspiration on how to wear colours! Love the first outfit! I like how you’ve woven some bright green stripes into a classic look. It makes it much more fun. I seem to have gotten some nautical by default this year. It seems like every swimsuit I have seen at stores is in this theme. It’s not my favorite look for but I think it’s elegant and classic and I like the way you’ve styled it. Thanks Heather. It’s always fun to be play with classical styles and do something just a little different with them…. Previous post: Less is always more and other style rules… What do you think?